And then sometimes, everything works. Yesterday was a perfect set-up for a domino-effect spiral into a helpless pit of anxiety and failure, but somehow, miraculously, everything went off without a hitch! 7:45 am I woke up to do my Russian homework. 10:00 am My weekly tutoring session began. I usually walk to my tutor’s house, as it only takes about 20 minutes, but yesterday I left the house late (as usual). Determined not to be late to my lesson yet again, I took a chance on a bus that I was only about 65% sure would get me where I needed to go. It worked. I even arrived almost 3 minutes early! 11:30 am I excused myself from the lesson half an hour earlier than usual, explaining that I had a lot of things to do today. I didn’t feel bad about paying the full amount anyway, though, because technically what I pay should be for two academic hours, or an hour and a half, but she always spends a full two hours with me. I walked to Resurrection Street from her house and hopped on another bus to get to where I was pretty sure there was a kassa to buy train and plane tickets. After withdrawing 10,000 rubles from a nearby ATM (something that in itself was a cause for anxiety) I bought a train ticket to Moscow and a plane ticket back to Arkhangelsk for Victory Day next week. First time buying a Russian train ticket, and first time buying a plane ticket from a kassa, check and check. Next, off to the grocery store to buy ingredients for an American-style trail mix–popcorn, raisins, peanuts, pretzels, M&Ms. By 12:45 pm I was home, where I made the trail mix, my offering for an event at the library later in the afternoon. And then I made it to the university with enough time to have lunch in the cafeteria. 1:40 pm a faculty meeting in the English department. Then, at 3:00 pm, I gave a not-terribly-well-prepared lesson on talking on the phone and numbers at the Rescue Service. I also had to cut this lesson short, unfortunately, in order to run home, change my shoes, pick up my snacks, and make it to the library ten minutes late. 5:00 pm At the library, the American Corner was hosting a trivia competition with America-themed questions for local school and university teams. It was a lot of fun to hear the tricky questions that had been submitted. There were a couple even I didn’t know; for example, what the historical figures carved on Mount Rushmore represent to the American nation. Fortunately, Russians are used to people with packets to store (if not doofy foreigners with packets), and it was all fine. This was such a day that I even managed to explain to the bartender at Pelikan, in Russian, what I wanted in my whiskey sour well enough that it came out basically perfect. When I got home at 2:30 am, I was exhausted. Collapsing into my freshly-made bed was a particular pleasure last night. But I was victorious! 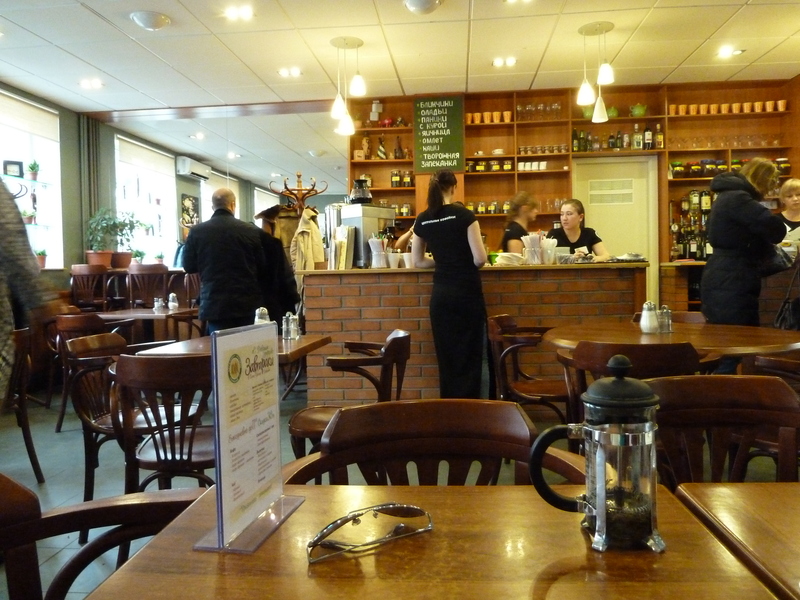 After privately, to myself, deciding that this cafe was my favorite in Arkhangelsk, I realized that it was uncannily similar in service plan and aesthetics to an American cafe. You come in, place your order and pay at the register, then sit, and your coffee is brought to you. If you want something more, you have to go back to the register. No “devushka!” when the waitress ignores you, no waiting for the bill at the end–there’s no ambiguity in the relationship with the waitstaff. Everyone knows their role and performs it well. And, it’s one of the two places where I know what words to say to get the coffee that I actually want. Add to that that they rarely ask if you have exact change, and that the prices are reasonable, and that the service is quick, and that there’s almost always a couch seat free, and that there are photos of zebras and Venice for sale on the walls, and I’m hooked. But even here, a variety of strange things keep you from ever quite forgetting that you’re not in Kansas. For example, the men who are served their fruit smoothies in elegant glasses with pink and yellow straws–and actually use the straws, slurping daintily while they talk in posturing grunts about whatever it is men talk about here. For example, the man who, one rainy Saturday morning, instead of the “Fitness Smoothie” ordered a whole carrot the size of a child’s forearm and sat crunching on it while his girlfriend flicked calculating glances at his eyes, wondering when to ask him when they’re getting married. For example, the woman in purple who comes in and in a voice too loud for the Arctic, announces to the waitstaff, “Hello, young people!” and then tells them exactly how to do their jobs while they smile and giggle. For example, the Tree Man, who dresses in long robes, and has flamboyant orange and green tattoos around his eyes and over his clean-shaven head, who comes to the cafe to meet with conservatively dressed people in black jackets and turtlenecks, and whom everyone ignores. For example, the middle-aged couple, resting from shopping, who sit without taking off their furs and overcoats and wait in silence for their fruit juice to come. The woman purposefully, deliberately swallows her entire drink in one long gulp, sweeping the straw back and forth across the bottom of the glass with her mouth to make sure she’s gotten every last drop, and then sighs deeply, regaining her breath as she stares into space and waits for her husband to finish. For example, every unmarried young woman dressed in an absurdly glamorous fox-fur vest who sits, one leg elegantly extended, the arch of her foot bent suggestively over six-inch heels, waiting for a coffee that would taste no different in Moscow, without taking off her frosted sunglasses. For example, a gaggle of almost-middle-aged women dressed in what look to me like middle school Snow Ball gowns, who swarm in to celebrate after a concert of some sort. They dominate the whole cafe, finally settling down to a moderate chatter in one corner. Some of them want salads, calling their order to the queen bee, whose olive green satin gown ends at her ankles to reveal practical black pumps. They’ve brought their own bottle of champagne. Last weekend, as I was walking to the library, I came across these pro-gay snowpeople lounging on the ground. I was so glad I had my camera! I’ve been curious and eager for any indication of attitudes towards homosexuality, since I know that Arkhangelsk has a law against “homosexual propaganda,” supposedly to protect children’s morality. The attitude I’ve come across most is tolerance mixed with vague and uncertain discomfort. People have the idea that they should be accepting of other lifestyles, but they don’t want to see or hear about gay people in their lives. I’m curious how long it was before these snowpeople were destroyed. Rainbowlicious snowpeople on the Embankment. Yesterday was an awesome day. On Monday, I finally got my copy of The Fault in Our Stars by John Green in the mail. I’ve been waiting for it since January, and since before then, when John and Hank started talking about it on their vlogbrothers videos. And yesterday, as we had the day off for International Women’s Day, at last I had time to devote to it. I immersed myself in the book in a way I’ve rarely done since high school, letting it take up my whole life. And really, this book can’t be read any other way. If it doesn’t take you over, you’re not paying attention. I can’t say that it’s been particularly fun or enjoyable to read this book– it runs the whole gamut of emotions, and many of them are unhappy ones. I forced myself to stop at 8:00, because I could see it was upsetting me, making me angsty and crabby (and not having eaten wasn’t helping). So I decided to go to the grocery store on my own, with Van Morrison plugged into my ears, to cool down. As I was walking along the street, trying to take in the sky’s particular velvety shade of blue, I was startled by a bright orange light to my right. 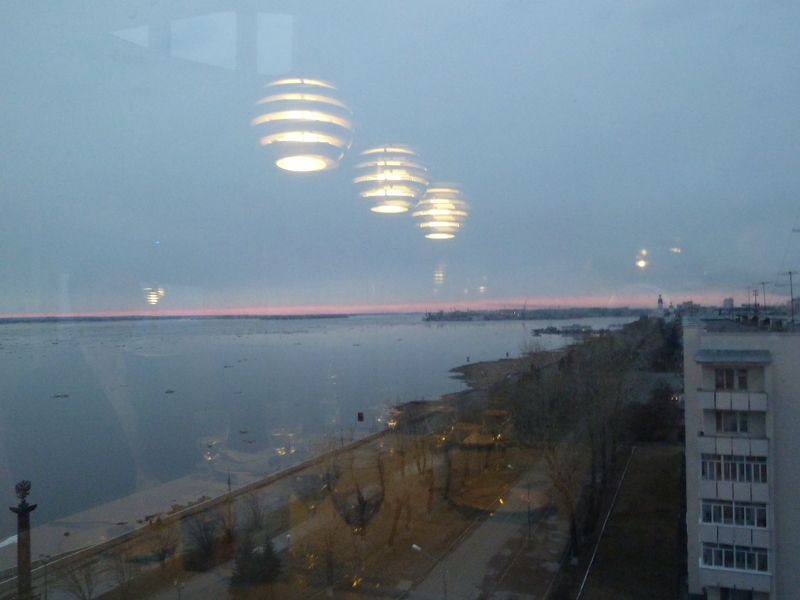 It looked like a street light, but it was a perfect globe shape, unlike any of the streetlamps in Arkhangelsk. “Is that the moon?” I thought. But it couldn’t be! It was too huge, too orange, far, far too bright. The possibility that it was the moon caught my fancy, though, and I veered off course to get closer, to find out. As I approached the end of the street, I became slowly more and more convinced that it was the moon, and not an ad or a man-made light, and the realization, coming upon me slow and uncertain, was like something rising in my throat. It was beautiful. It was like nothing I’d ever seen before; no Pennsylvania harvest moon could compare. 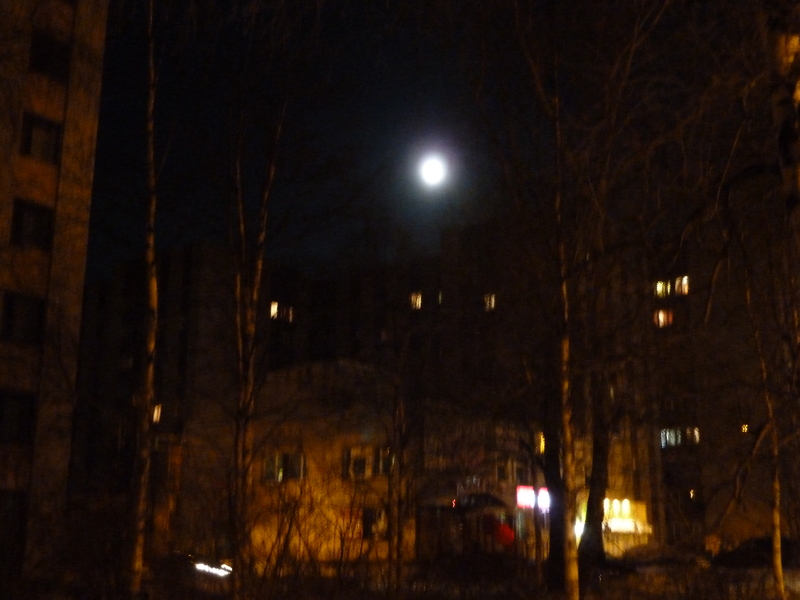 I stood at the end of the street for a few minutes, gazing at the full moon in awe. And then I went on to the grocery store. When I returned, Andrea, the German teacher, was visiting with Łukasz, and they were discussing, among other things, the news of a recent solar storm, which meant the possibility of the Northern Lights appearing. I responded with restrained enthusiasm. Łukasz and Nils and I had walked to the river and along the Embankment for a good hour and a half Tuesday night, in the hopes of glimpsing the Aurora, with no luck. Andrea admitted that though she’s been living here for three years, she has yet to see the lights. I made myself dinner and took a shower, planning to do some school work before going to bed. I had barely stepped out of the shower, though, when Łukasz cried out, “Aurora!” Dorota, the other Polish teacher, had just called him from the street outside our building to say that she could see the lights! 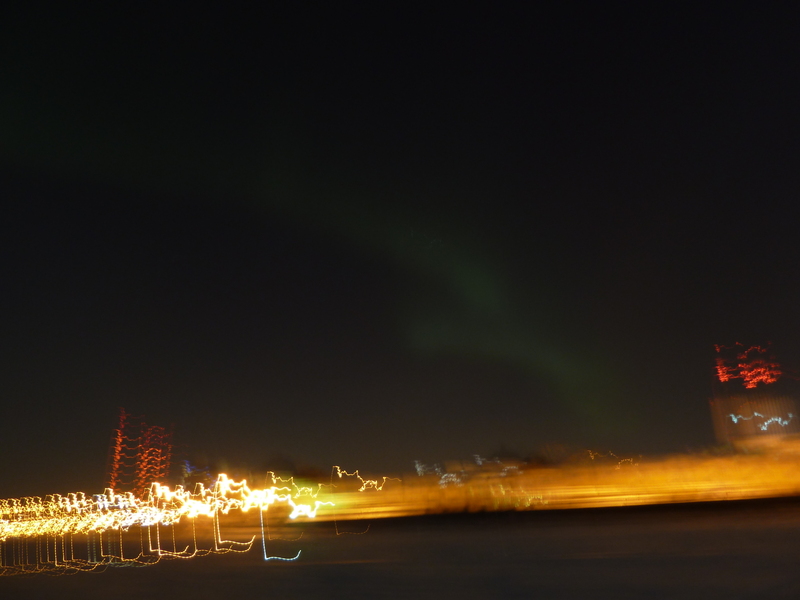 I changed back into jeans, pulled on my snow boots, and mashed a hat over my still wet hair, and we practically ran down the stairs to meet Dorota, staring up at the patches of sky visible between the buildings and street lights, where, lo and behold, a pale grey ghost of Aurora was hanging. We shortly decided to take a taxi to the Embankment, where it would be darker. We walked out onto the frozen river, craning up at what looked like a greenish gray lunar rainbow arcing over the river, with the moon now fluorescent white, like a spotlight behind us. We moved slowly further out onto the ice, fiddling with the long-exposure settings on our cameras, talking about how cold it was, staring always upwards, watching for any little change. It was quiet and it was not spectacular, but at the same time, it was exactly as I imagined it would be. Just like the photos on the Internet, just like the description in The Golden Compass. Any words I could think of to describe it sounded like something I had read before. Twice, the pale smudge turned into something like what you see in pictures– green and peach-colored curtains winking and dancing up above. It was like a cosmic, iridescent snake across the sky. It was like God finger-painting. And the whole time, the bitter, hard cold of the exposed river created this dissonance between my body telling me to get inside, to get warm, as soon as possible, and my soul telling me to stay. And then, when we finally came home, I found out that the Russian representative to the Eurovision Song Contest in May will be a group of babushki from Udmurtia. Can this world get any more wonderful and whimsical than that? I had a busy, busy weekend, and now I’m sick. On Friday, I went to a fantastically unique and kind of weird concert, again at the former Lutheran church. It was a truly multi-cultural concert. First, a quartet from Norway played a few classical pieces. Then, the headliner of the show, a Norwegian soprano, joined them in just a bedazzlement of drama. She wore a long red gown under a floor-length midnight teal robe with a high collar and gigantic sparkling red earrings, her short hair slicked back over her head. She also sang magnificently. The next piece was a new work by a Norwegian composer, who actually came to conduct it as well. It was performed by the Norwegian quartet, a Russian string ensemble, three Russian traditional folk singers, the Norwegian soprano, and a Nenets soloist. The Nenets are a Russian indigenous people. The Norwegian part of the composition was very dischordant and clashed with the traditional Russian and Nenets singing dramatically. It was interesting and I would recommend it, but I can’t say that I enjoyed it. 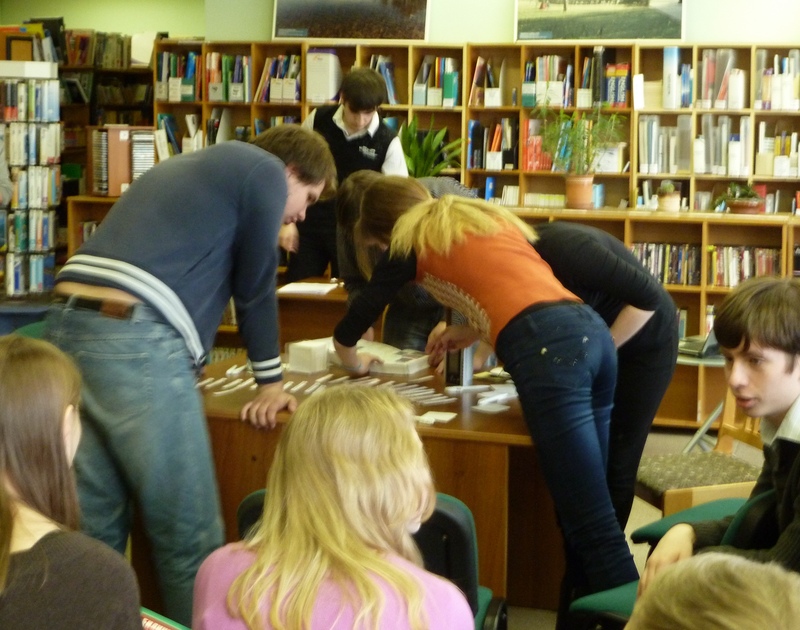 Then, on Saturday, there was a particularly interesting conversation club at Dobrolyubova. It was advertised as a “conversation club for adults,” and so there was a wide variety of people from the community, from a dentist to an engineer to a philosopher. The conversation was about Russian culture, and whether it exists or not, and why the rest of the world doesn’t know anything about it. Some people cited Dostoevsky, Tchaikovsky, and Chekhov as the only Russian culture. Some said that culture is what you do every day, and it’s not that much different in Russia from anywhere else. One man said that it was too personal for him to talk about in public. Another said that most Russian culture was destroyed during the Soviet times. Then, the suggestion arose that it was impossible to talk about Russian culture while in Russia, that one had to leave the country to be able to talk about it objectively, to be able to compare it with other cultures. Again and again, they mentioned the tension of being positioned between East and West, between China and Germany, the idea that Russian culture could never reconcile itself to that geographic contrast. It was fascinating to hear all these very strong, differing opinions, but it was also very stressful to be at the center of this very complex conversation that I felt both responsible for and unqualified to direct. And then, on Sunday, I went to the Maslenitsa celebration on Solombala island with Nikolay from the conversation club and Łukasz! Maslenitsa is the Russian version of Mardis Gras, the festival right before Lent begins where you eat a lot of blini and butter and other delicious things. I took a ton of pictures, and you can check them out on my facebook album here. I was meant to substitute teach some classes today for another teacher, but I felt so miserable last night that I called off and slept for twelve hours instead. The key situation at SAFU is pretty absurd. All classrooms and offices stay locked all the time, until someone needs to use the room and gets the key. 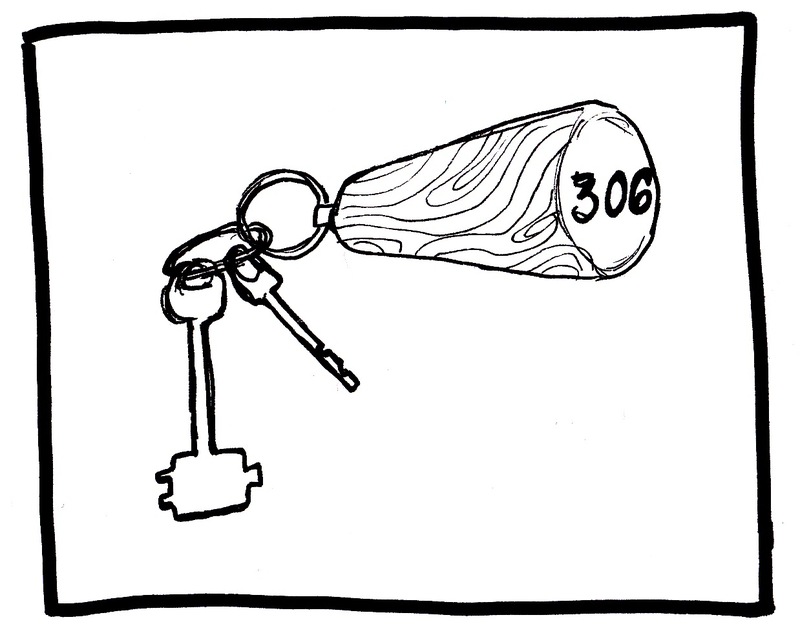 The default location for all keys is a little office at the entrance to the building called the vakhta, which Multitran translates as “watch” or “reception desk,” but which is really a kind of troll at the gate situation. 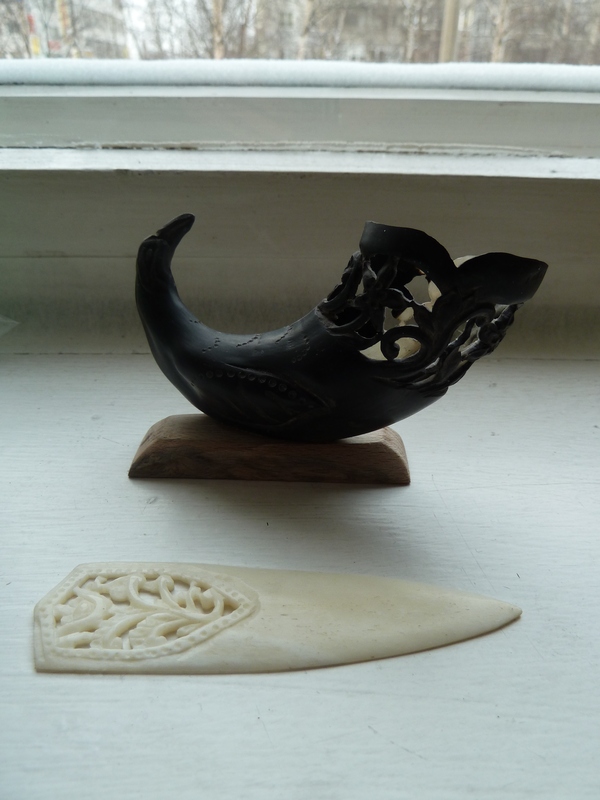 Not to speak unkindly of the vakhtyory who work there and guard the keys– they are all perfectly pleasant. At the beginning of the day, a bunch of keys are taken to the dekanat, or dean’s office, which is now (due to renovations) on the second floor, where they sit in a little key tray made out of cardboard. The keys to some of the department offices, as well as many classrooms (but not all of them) are there for most of the day, and anyone, student or teacher, can go and get [almost] any key. Padlock on the door means no one has been there yet, and the key is [probably] still at the vakhta. You must go back down to the first floor to ask for it. If the door is locked but the padlock is not there, someone has been here and has taken the key with them. A piece of paper stuck to the door will [probably] tell you what room they are in. It’s fine to interrupt their class in order to get the key from them. If there is no one in the room indicated by the paper on the door, try the dekanat. If it is not in the dekanat either, check the teachers’ lounge, the American Studies center, and the German kafedra. Sometimes people decide that those places are default locations for the key, or the secretary takes it there for a short break. Once I’ve found the key to the kafedra, there is still the matter of the classroom. Russian universities don’t work like American ones, where you have the same class in the same room every week. Room assignments change from day to day and week to week, all dictated by the dean’s office and announced each day on a posterboard schedule hanging in the hallway outside the English kafedra. Ostensibly this has to do with the general lack of classroom space and resources such as TVs and rooms with screens for projectors. But in practice, I’m often assigned a room with a TV when I don’t need one– and sometimes I don’t get a TV when I do need one, even when I’ve asked for it. For example, last week I requested a room with a TV for my video class. But, because the class is still listed under Elena’s name, instead of mine, they weren’t able to give me what I asked for. So, I was left TV-less for the day. In a moment of inspired resourcefulness, I remembered that I’d used the flatscreen TV in the teachers’ lounge for this class before, checked the schedule to see if anybody else was assigned that room for that period, and quietly told the students to go there, without asking or telling anyone else. Success! Earlier in the week, I was assigned the Swedish room, whose key, unbeknownst to me, can only be obtained by a teacher. Usually the students get the key and congregate in the classroom before I even get there. Not this time! In a crazy, haphazard, rule-free system, this one key has a special note on it warning that only teachers may touch it. And then, later, I was assigned a room that remained inexplicably locked despite the students’ efforts. I went to the dekanat; no key. 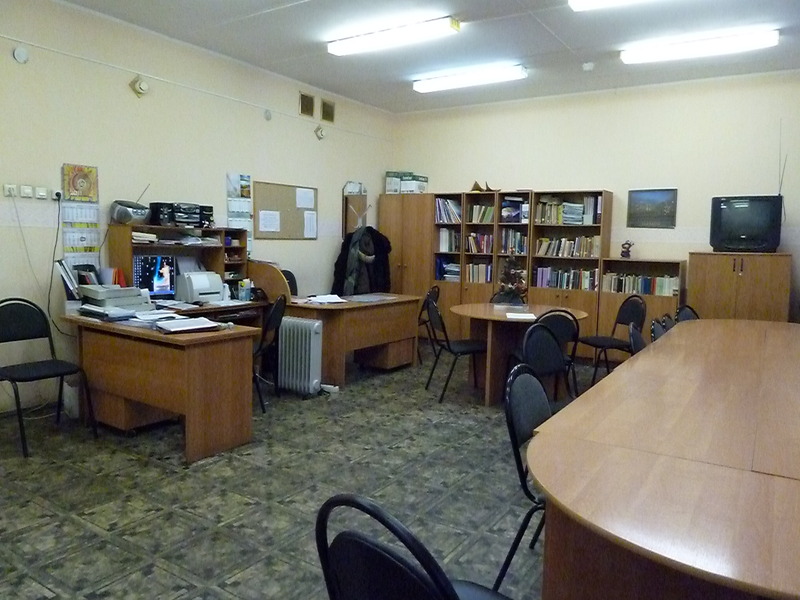 I went to the vakhta, where I was informed that the room was the personal office of Andrea, the German teacher, and that they had a special note saying that only she could be given that key. I went back to the dekanat and explained this to them, to discover that they thought I was Andrea the German. They gave me a different room. Dealing with this very free-form system is its own special kind of frustration, but offers its own special sense of satisfaction when conquered–especially when once you get inside the classrooms, you have the kind of engaging, enthusiastic, productive classes I was lucky to have this week. This semester is already looking good! It all starts with Mikhail Lomonosov. If you haven’t ever heard of Lomonosov, get off my blog, how dare you. Just kidding! I barely knew who he was before I came here (but oh how that was to change). Lomonosov was a pioneering scientist, academic, and poet, who discovered some stuff about Venus, among other things. But, the only reason I had ever heard of him before was because of briefly living in Moscow State University, which is one of two universities in Russia named after the mighty Lomonosov. Guess what the second one is. That’s right! My very own Northern (Arctic) Federal University Named After M. V. Lomonosov! Also known as SAFU. The reason SAFU gets to be named after him is that he was born in Arkhangelsk Oblast. 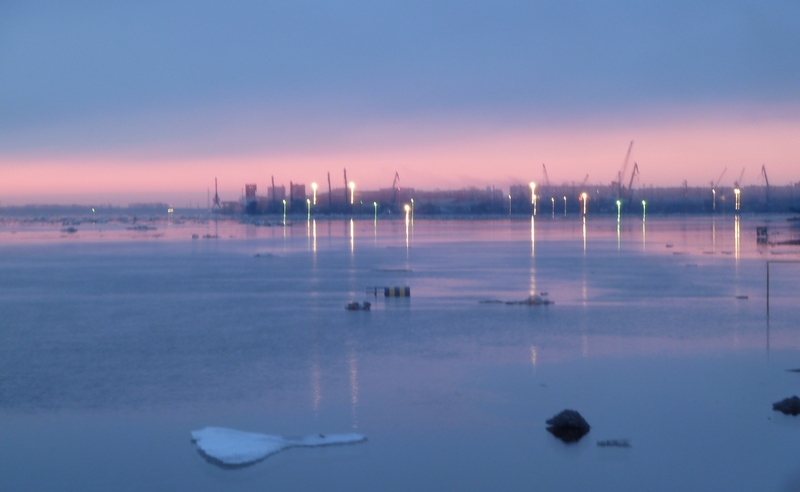 The Homeland of Lomonosov is about an hour and a half drive away from the city of Arkhangelsk. The story goes that when he was nineteen, having learned everything he could in Arkhangelsk, he walked to Moscow, where he continued his studies and would later found Moscow State University. Arkhangelsk never forgot him, though; there are statues and busts of him everywhere, his face hangs in the entrance of the library and on the airport, and he has a street named after him in the city. 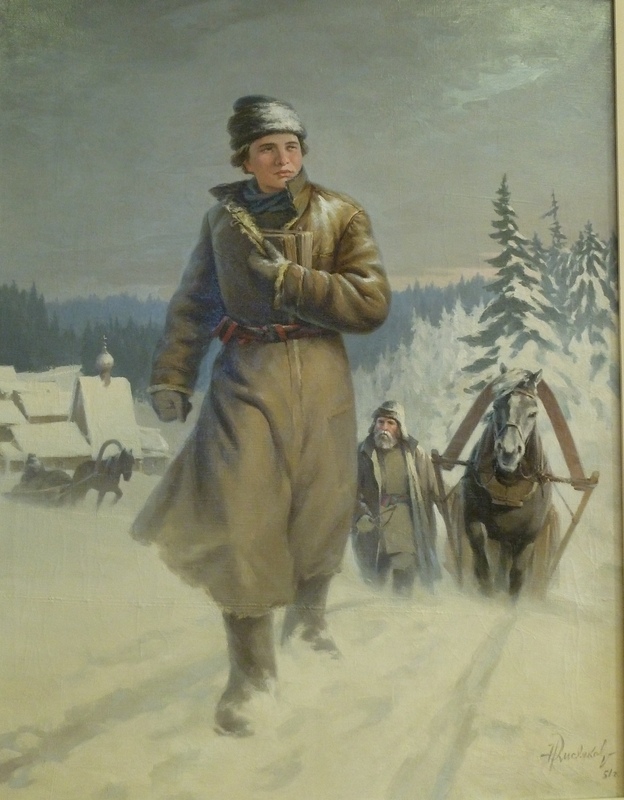 Young Mikhail setting off for Moscow– wasn’t he a cutie? 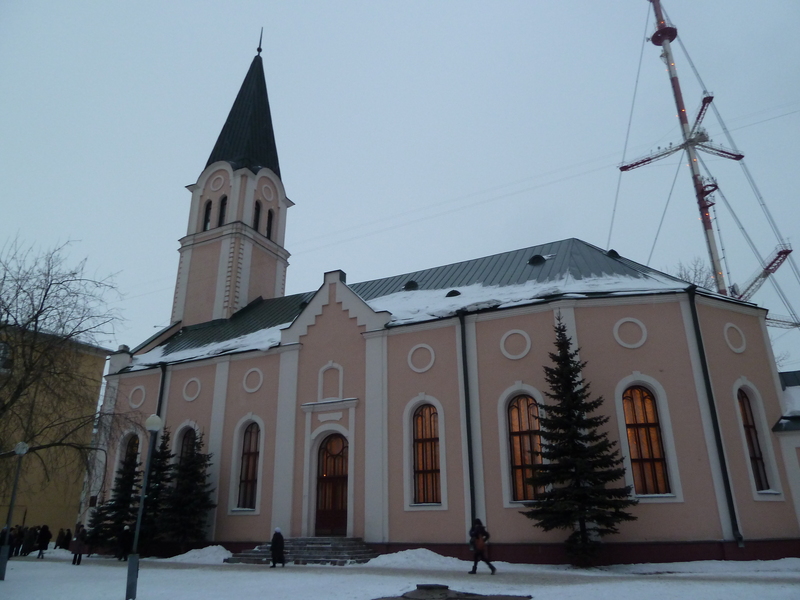 Anyway, one of my colleagues, another Elena, has a relative who lives in the Homeland of Lomonosov (now, surprisingly, called Lomonosovo), and she offered to take me there last weekend to see the museum. I was delighted. She and her husband picked me up around 10 am, and the sun was low and red on the horizon and made everything just overwhelmingly beautiful. After stopping in Novodvinsk (a town noted for the distinctive smell that continually emanates from the paper factory) to pick up treats for tea, we went on to Kholmogoryi, the town right across the river from Lomonosovo. There, we met Elena’s nephew Alyosha and his friend at the store, to buy some furniture. Because Elena and her husband have a flatbed truck, they were helping Alyosha transport the furniture from the store to his apartment. They loaded the furniture in the back and Alyosha and his friend and Elena piled into the backseat on top of some sacks of potatoes, and we continued on to the island of Lomonosovo. After we dropped off the furniture, we went to the museum. It was pretty cool, and I took a couple of pictures there, which you can see more of in my facebook album here. But the most fun part, for me, was getting to hang out with Elena and her family, and hear their stories and jokes, and I felt like it would be rude to be taking pictures of these people I barely knew in their home. Russia really is full of bears! 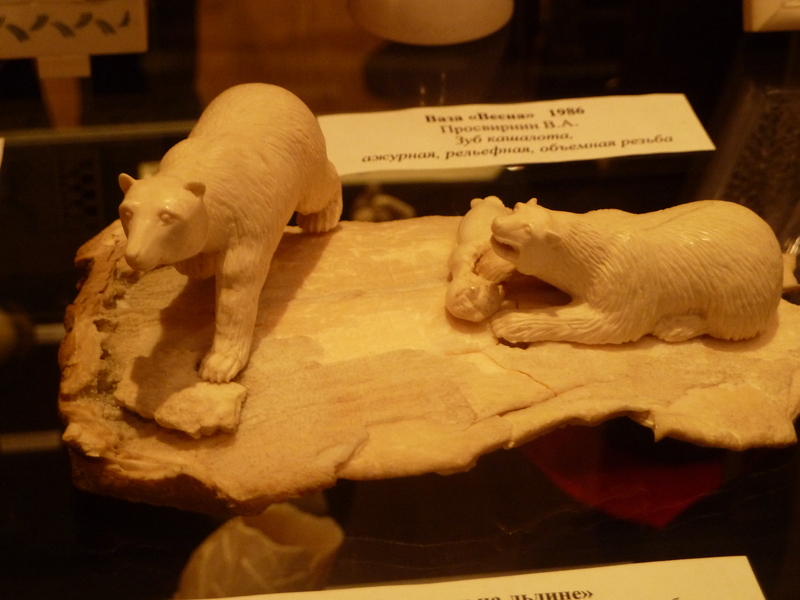 One of the things we saw at the museum was a huge display of these just flabberghastingly intricate trinkets carved out of bone—there were tiny boxes and chess sets and carved portraits of Lomonosov, and goblets with Soviet leaders on them, and figurines of bears and birds and fish and deer. So we sat in the living room and drank extraordinarily strong black tea, and ate sandwiches made of salmon and cheese and white bread (sliced “one-handed style,” Elena’s husband joked—because if you cut thin delicate slices, you need one hand to hold it, and one hand to catch the crumbs). And a cake that was absurdly sweet and delicious. Alyosha showed us pictures of his son, and Elena marveled at how much he looks like Alyosha; they talked about the landlord, whose voice you could hear from downstairs, and about the benefits of having a first versus second floor apartment. Before we left, Alyosha copied some movies to a flash drive for his friend to take home with him. The snow and ice make the road better to drive on, they told me, because it fills in all the horrible potholes. On the way home, I asked Elena about how she and her husband met. She told me about the traditional gauntlet of trials and tests he had to go through to get to her on their wedding day, and about collecting medicinal herbs for a country-wide competition every year when she was a Young Pioneer back in the Soviet times, in hopes of winning a vacation to the south. I told them about how different Pennsylvania drivers are from Russian drivers, they reminisced about how much worse the roads used to be. They dropped me off at home and I took an exhausted hour-long nap. It was a great day. But the part I didn’t tell you is the part where there was no bridge to get to the island, and we just drove across the frozen river. There were even road signs for the crossing. And a couple dozen meters away from where the cars cross, there were people just walking back and forth across the river, too. When it’s not winter, there’s a ferry that takes cars to and from the island. The other part I didn’t tell you is that there’s no running water on the island. After I went to the bathroom at Alyosha’s apartment, for me to wash my hands, he put some water into a pan and then poured it out over my hands into the sink. And the whole time I was on the island, I kept seeing people with little sleds, like the kind that people in Akrhangelsk drag their kids around on, except that they were dragging little tanks of water around. 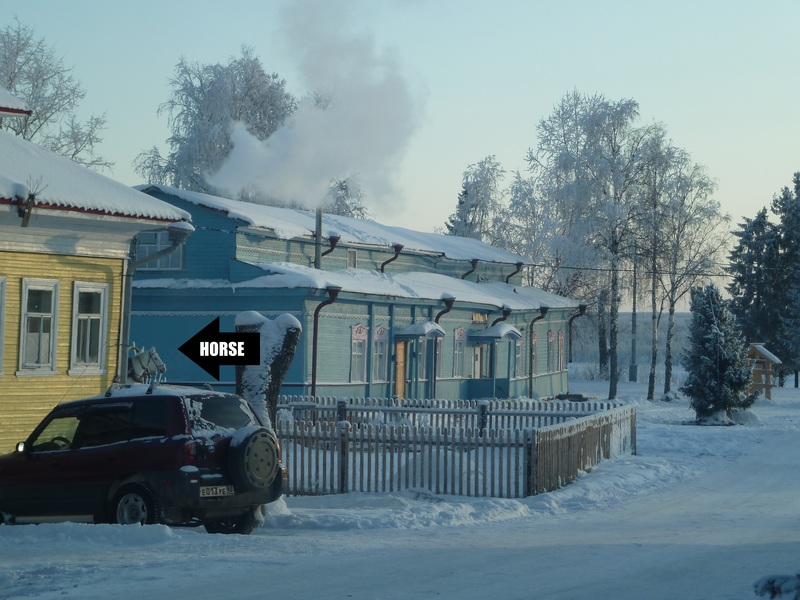 As we left, there was a horse hanging out between two houses, and what you can’t see from the picture is that he’s harnessed to a little sledge that’s loaded with more water tanks. Back in late October, when it was still relatively warm, our water in the dorm got shut off for a couple of hours once or twice while there were repairs being done on the pipes. In a brief moment of frustration, Łukasz said to me, “Water is civilization, Rutka!” and I agreed with him at the time. But, like, clearly that is not true. It was weird to me because it seemed like no big deal to be washing my hands under water poured from a pot, while at the same time I could recognize that this was not the definition of “civilization” I had been working with. I guess, really, water is a necessity for life, and the way we get it is part of why there are different civilizations, different cultures.